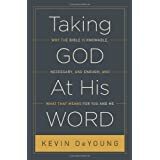 Kevin DeYoung, Taking God At His Word: Why the Bible is Knowable, Necessary, and Enough, and What That Means for You and Me (Crossway, 2014). He sees Psalm 119 as a love song affirming what we can believe, feel, and do with the word of God. The word is true, demands what is right and provides what is good. We should feel delight in the word (Psalm 119:14, 24, 47, 70, 77, 143, 174), have a love for it ((119:48, 97, 119, 127, 140, 167), feel a desire to keep it (119:5, 10, 17, 20, 40, 131), and to know and understand it (119:18, 19, 27, 29, 33, 35, 64-66, 74, 124-125, 135, and 169), and depend on it as Jesus did (Deut 8:3; Matthew 4:4).